We are currently working with a RightStar customer to help re-engineer their FootPrints system to make it better. And last Wednesday, I interviewed a Remedy consultant working at a government account.. When I asked about their ITSM implementation, she responded that there was room for improvement. The culprit in both cases? Poor user adoption. This is an astounding statistic and reminiscent of the quote form Management guru Peter Drucker, “Culture eats strategy for breakfast.” Yet, RightStar spends 95% of its implementation consulting time on products and processes, and very little time on people. What gives? Of course, most ITSM systems and processess are broken and it is up to us to fix things. ITIL, by itself is not the answer, and a toolset such as Remedyforce is not necessaily the answer either. Recently a cutomer moved from SDE to Remedyforce. Shortly after implementing Remedyforce, we received an email saying, “we tried Remedyforce and don’t like it. What else you got?” Fortunately, we had FootPrints to offer…. Go for quick wins. Don’t try to implement all ITIL 26 processess at once. Look for one or two processess and put all effort there. 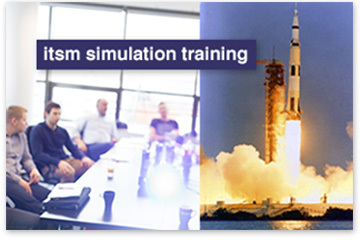 Education and simulation training. Since the biggest challenge is the people, why not focus on training. The Apollo 13 simulation exercise is an excellent way to kick-off any project as it help people change the way they looked at ITSM. Who thought ITIL could be fun? Measurement and validation. Work on improvements in reporting, or for those more serious, look at ITSM benchmarking from MetricNet. This entry was posted in Business Management, FootPrints, ITIL, ITSM, Remedy, RemedyForce, RightStar, Technology Trends, Uncategorized and tagged Apollo 13 simulation, BMC, FootPrints, ITIL, ITIL Simualtion Training, ITSM Adoption, ITSM Friction, Remedy, Remedyforce, RightStar. Bookmark the permalink.